Universal coffee makers produced in the U.S.A. by Landers, Frary & Clark in New Britain. Made in nickel-plated brass or copper, these spirit burner models have a 0.75 to 1.5 litre capacity. The water is pumped to the surface through an internal tube and filters through the ground coffee repeatedly in a continuous cycle. 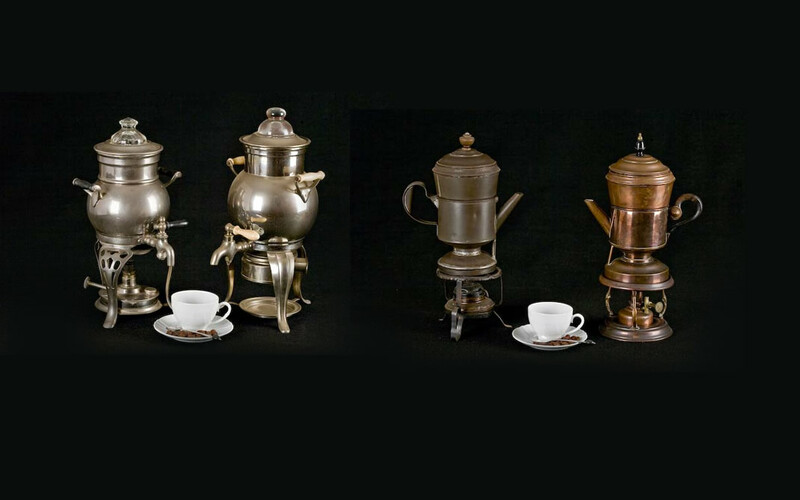 These elegant coffee makers belonged to wealthy middle class American and English families from the late 19th to the early 20th century and could be used in the dining-room to actually serve the coffee. Two tinplate and copper models of the coffee maker produced by French company Bouillon & Siry to Louis Malen’s 1877 patent. These machines were widely used at the time in both France and England. The water was pumped to the surface and filtered repeatedly through the ground coffee in a continuous cycle. Electric Swan-Brad coffee maker produced by Bulpitt & Sons Ltd. in England made in 1947 (on the left) and 1961 (on the right).